IMPACT Exhibition Management Co., Ltd., the management of IMPACT Exhibition and Convention Center, Muang Thong Thani, celebrates its the 20th anniversary of conducting the convention and exhibition business by organizing CSR activities under the “1 Million:1 Hospital” project with the objective to provide 20 hospitals in need across Thailand with funds to purchase modern medical equipment, the funds will also allow them to provide their patients with timely treatments. Hence, IMPACT has chosen Pranangklao Hospital of Nonthaburi province to be the pilot hospital to receive the first 1 million Baht funding from the campaign. They aim to provide 20 hospitals with the lack of fund and medical devices with 20 million Baht worth of funding by 2019. Bangkok, Thailand, 26 February 2019 – Beyond Beauty ASEAN Bangkok (“BBAB”) is all about finding new opportunities and helping exhibitors and buyers to form strategic business alliances. The 6th edition which is scheduled from 19 to 21 September 2019 at IMPACT Exhibition & Convention Center, presents a new focus on Cambodia, Laos, Myanmar, and Vietnam (“CLMV”) for the Thai beauty market. BLAND continues to actively support the growth of IMPACT Muang Thong Thani as the exhibition and convention center hosts over 1,000 events and welcomes more than 10 million local and international visitors each year. The company has recently invested THB40 million for the expansion of Muang Thong Thani Outlet Square to have a gross area of 15,000 square meters. The outlet shopping center is open daily, offering a wide selection of fashion items, clothing, footware, sports gear and equipment, eyeware, and watches from Minor Group covering leading brands such as Nike, adidas and more, as well as cosmeceutical products, with up to 80% discount. IMPACT, approaching its 20th year in business, emphasized its ability to provide diverse choices of venues with a comprehensive range of facilities and one-stop solutions. Starting from January next year, exhibition halls and facilities at IMPACT will be renamed to make it easier to remember. The company also continues to adopt technology in business like 360-degree views of function rooms and mobile application that facilitates the traffic and help users find parking spots. As part of “IMPACT Touching Heart Sharing Love” project, the company plans to donate 20 million baht to support the purchase of medical equipment and charitable organizations relating to nursing, education, and community wellbeing throughout 2019. “IMPACT Speed Park”, managed by IMPACT Exhibition Management Co., Ltd., is Thailand’s first ever electric go karting venue that meets international standard. It first welcomed visitors with Sodi RTX electric go karts from global leading manufacturer SODI Kart and has now reached a momentous milestone of 2 years old, drawing in over 20 million Baht in revenue where a portion came from being an event venue provider such as hosting private parties and functions to premium brand product launches. It is presently favored among customers who want to deviate from the conventional functions and events atmosphere and create a sense of exclusivity for their guests. Over the past 2 years “IMPACT Speed Park” has boosted an exponential increase of 65% in tourist visitors, hence aiming to double this growth by 2019. IMPACT has unveiled a proactive plan to increase the combined revenue of its three Thai and northeastern Thai restaurants by 5-10% next year, up from over THB 15 million at present. The three restaurants include “Manorah” Thai restaurant at IMPACT Exhibition and Convention Center that offers authentic Thai cuisine and catering service and two northeastern Thai restaurants at IMPACT Lakefront namely “Isan @Arena” and “Isan Jim Joom” that serve flavorful northeastern Thai dishes with a fusion twist made with fresh ingredients. Target market includes huge crowds attending events at IMPACT Exhibition and Convention Center and customers from Muang Thong Thani’s neighboring areas, as well as those who are interested in healthy Thai recipes. IMPACT Exhibition Management Co., Ltd. (“IMPACT”) and Deutsche Messe AG (“DMAG”), the organizers of CEBIT ASEAN Thailand (“CEBIT ASEAN”), opened the doors of the three-day trade exhibition today. CEBIT ASEAN is expected to attract 8,000 technology professionals and business leaders during 18 to 20 October 2018, at hall 7-8, IMPACT Exhibition and Convention Center, Thailand. As the business events industry continues to thrive rapidly, myriad exhibition centers across the globe recognize the growing needs of facility upgrades, renovations, and expansion to accommodate a bevy of mega events and trade shows, and we are no exception. Bangkok Land Public Company Limited, the investor of IMPACT Exhibition Management Co., Ltd, will be investing 115 Million Baht in a bid to add more pedestrian bridges across the venue for seamless convenience. IMPACT Exhibition Management Co., Ltd. (“IMPACT”) and Deutsche Messe AG (“DMAG”), organizer of the world’s leading trade technology and digital exhibition, jointly present the first edition of CEBIT ASEAN Thailand (“CEBIT ASEAN”). CEBIT ASEAN is supported by both public and private organizations, including the Ministry of Digital Economy and Society; Ministry of Science and Technology; Microsoft; Logitech; ABeam; and more than 200 companies and brands. 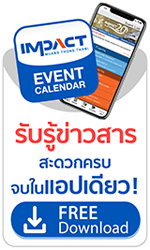 CEBIT ASEAN will be held from 18 to 20 October 2018, Hall 7-8, IMPACT Exhibition and Convention Center, Bangkok, Thailand. The event is expected to attract 8,000 technology professionals and business leaders.